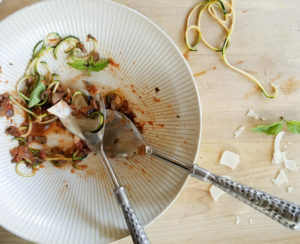 Shitake and cremini mushrooms take the place of meat in this surprisingly hearty Mushroom Bolognese that will please even the most diehard meat-eater. Recently I was talking to a coworker about how I don’t eat meat very often and hadn’t cooked it in a while and he got a sad, questioning look on his face and said, “What about your husband…? ?” Like he took pity on my poor, meat-deprived husband. I laughed and told him not to worry, I was sure my husband got quite enough meat while eating out for lunch with all the BBQ joints or “Taco Tuesday’s” he’s always mentioning. But a few nights ago I took pity on Trey, wondering quietly to myself if I was a mean-ol’ wife, never welcoming my husband home from work with the fragrance of a slow roasted rump or leg of something-or-other wafting from the oven. Or a martini. Or wrapped in saran-wrap… (all things my childhood friend and I discovered in a book we sat giggling over in the back of the library). What if he was planning on working out when he got home? A martini might not be the best pre workout drink, lest he drop a dumbbell on his foot, and I seriously do have better things to do with my time than wrap myself up in plastic like a pork cutlet at the deli counter. Besides, how many tubes of saran-wrap would it take to wrap one’s self from neck to toe? That sounds like it could get expensive, I mean it’s not like you could re-use the plastic wrap after that. The more I pondered this the scarier the scenarios became… what if I wrapped myself too tight and couldn’t walk? What if I tripped making my way to the door, martini in hand? I pictured myself wriggling around on the floor like an insect struggling to emerge from a cocoon, broken glass, gin and olives scattered all around me. Once Trey finally arrived home would he just step over me like a zombie lured to the kitchen by the smell of roasting meat drifting from the oven? No, no, this would not turn out well at all. 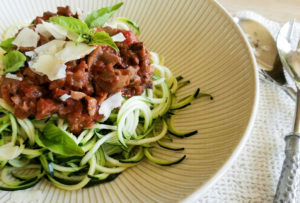 I decided a safer alternative was to replace my normal Mushroom Bolognese with a meat version. 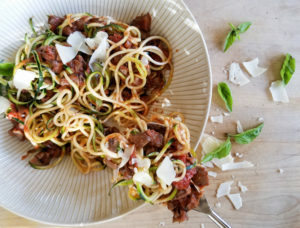 I picked up some pasture raised, 100% grass fed buffalo at the local market but decided to stick with my normal zucchini noodles instead of regular pasta, I do have some standards after all. But here’s the kicker… after we finished dinner Trey admitted while this version was good he actually preferred my mushroom version better! P.S. If you’re interested in learning more about how one was supposed to become a better wife through the use of plastic wrap and alcohol, I’m sure there’s an old copy of that book left forgotten in the back of your local library. You will probably find it stuck somewhere between copies of Mad Magazine and Nancy Drew Mysteries years ago by some giggling pre-teen girls. 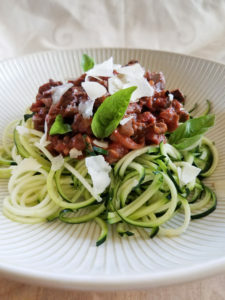 The Bolognese makes enough for 4-6 servings, depending on how much sauce you like. 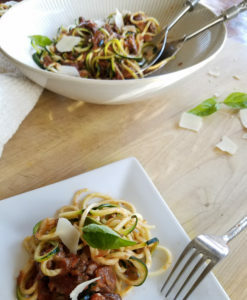 I prefer to make the zucchini noodles at home so they are fresh but if you don’t have a spiralizer, you can buy them in the produce section of most grocery stores. 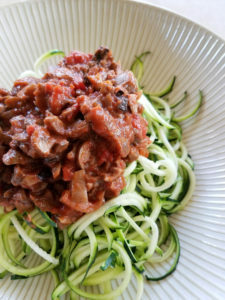 I don’t heat my zucchini noodles, rather I let the sauce warm them slightly but if you prefer them warmed you can blanch them in a pot of hot water for just a few seconds – just remember this will make them softer. Personally, I prefer the “al dente” texture of them uncooked. Heat the olive oil in a sauce pot over medium-high heat and add the garlic and onions. Cook, stirring occasionally, until the onions are translucent, about 5 minutes. Turn down the heat if the garlic starts to burn. 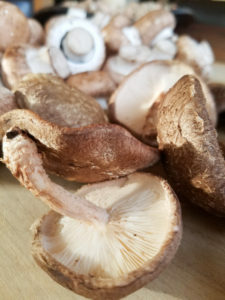 Add the mushroom and salt and continue to cook until the mushrooms expel most of their liquid, about 20 minutes. Stir in the herbs and wine and reduce to a simmer for another 5 minutes. Add the tomatoes, stir well and cook at a low simmer for 15 minutes or up to an hour. The longer you simmer the sauce the more the flavors will deepen. Remove from the heat and stir in the cream. Taste and adjust flavors, adding more salt, herbs or cream as needed. 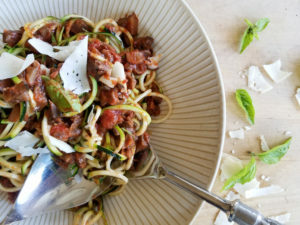 Serve over zucchini noodles and top with parmesan cheese. I made this the other day and it was delicious!! The kiddos and hubby loved it too, which is a huge win in my book! Keep the great recipes coming! So glad you all liked it Jenna, thanks for making it and letting me know!